The changes in volatile compounds of living oysters Crassostrea gigas with shells under air-exposed storage for 7 days at 5 and 20 °C were investigated using an electronic nose system and a gas chromatography–mass spectrometer (GC/MS) with headspace solid-phase microextraction (SPME). Principal component analysis of a data matrix obtained from the electronic nose response and sensory evaluation showed deterioration of oyster odor during the storage period. Headspace SPME–GC/MS analysis revealed that 1-penten-3-one decreased to undetectable levels, and volatile carboxylic acids derived from anaerobic end-products and 1-propanol increased during air-exposed storage. The detection of trimethylamine was observed only in living oysters stored at 20 °C. Amounts of 1-penten-3-ol and 1-octen-3-ol showed few changes through the storage periods. 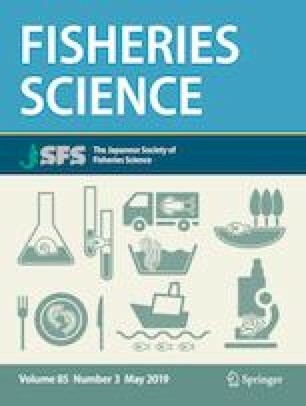 These data suggested that most of aldehydes decreased, whereas trimethylamine and volatile carboxylic acids such as propanoic acid accumulated in deteriorated living oysters stored under air-exposed conditions. Consequently, detection of trimethylamine and volatile carboxylic acids would be useful indices for suitable storage conditions of living oysters. This work was partially supported by a grant from The Towa Foundation for Food Science and Research.